Streaking UFC middleweight contender Israel Adesanya is easily one of the most hyped fighters on the UFC roster at present. Former UFC middleweight champion Michael Bisping is impressed by the Nigerian-born New Zealander — but not so much that he believes he couldn’t beat him. In fact, Bisping believes he’d have “an easy time” against Adesanya. Since joining the UFC, Israel Adesanya has gone 4-0, defeating Rob Wilkinson, Marvin Vettori, Brad Tavares, and most recently, Derek Brunson via first round knockout. The streaking striker has been rewarded for this success with a UFC 234 showdown with former champion Anderson Silva. The winner will reportedly get a shot at the UFC middleweight title. Michael Bisping last fought in late 2017, when he was knocked out by top middleweight contender Kelvin Gastelum. In his next most recent fight, he surrendered the belt to the returning Georges St-Pierre, coming up short via submission. 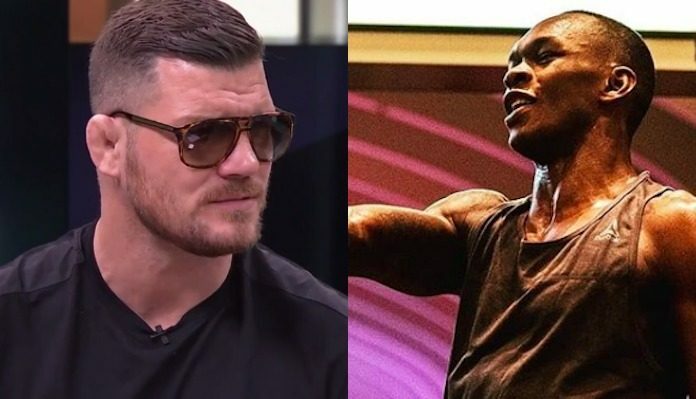 How do you think a potential fight between Michael Bisping and Israel Adesanya would go down? Make your opinions heard in the comments section below. This article first appeared on BJPENN.COM on 12/3/2018.